AUSTIN, Texas — The latest symbol of Trump administration immigration enforcement is a group of migrants confined to a chain-link enclosure under a bridge in El Paso, Texas. Customs and Border Protection officials have said the Border Patrol is holding immigrants in the makeshift cell because they can’t keep up with screening the hundreds of immigrants coming to the border daily and the thousands arriving weekly. 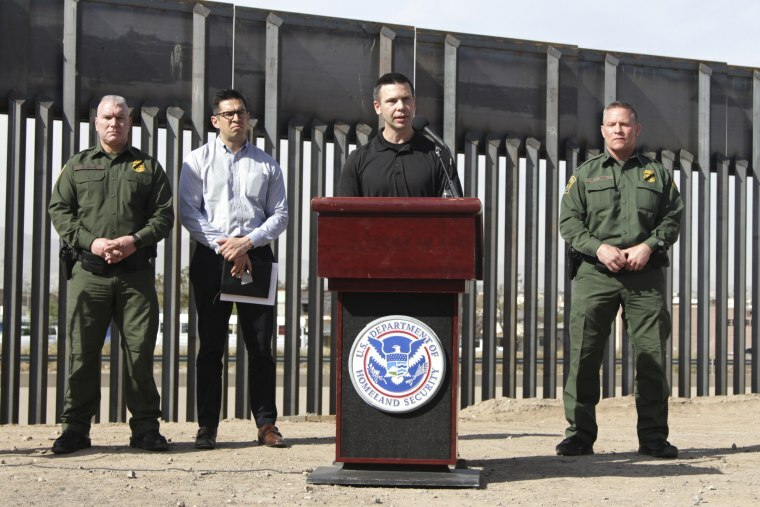 Customs and Border Protection Commissioner Kevin McAleenan, at a news conference in El Paso on Wednesday, declared that the immigration system’s breaking point arrived this week in El Paso. “CBP is facing an unprecedented humanitarian and border crisis all along our southwest border, and nowhere has that crisis manifested more acutely than here in El Paso,” he said. There is no doubt the city is seeing more immigrants arrive at the border, most of them families and children. As McAleenan spoke, CBP had some 13,400 people in custody in the sector. Overall, border apprehensions are lower than they have been in previous years, but they are increasing. McAleenan blamed the situation on migrants and smugglers who know that immigrants will be released and allowed to stay in the United States while their asylum cases are pending. He also blamed “court orders that undermine the integrity of our immigration system.” Lawsuits have led to court rulings blocking some Trump immigration enforcement actions, such as separating children from their parents when they arrive at the border. McAleenan also blamed a law that says children cannot be returned to their home country if they come from countries that are not contiguous to the United States. On Thursday, NBC News reported that Homeland Security Secretary Kirstjen Nielsen plans to ask Congress to allow the agency to deport unaccompanied children. House Homeland Security Committee Chairman Bennie Thompson, D-Miss., in a statement to NBC News on Thursday, blamed Trump and the “complete failure” of his border security and immigration policies. He said those policies have made the humanitarian situation worse by blocking families who present themselves at ports of entry and request asylum. Rep. Joaquín Castro, D-Texas, sponsored the House version of a resolution approved by Congress to end Trump’s declaration of a national emergency in order to get more money to build a border wall. Trump vetoed the resolution and a House vote to override the veto failed. Castro also said the Trump administration worsened the situation on the border, pointing out he’s been to the Texas-Mexico border several times in his home state. In addition, he said the Trump administration has “undermined our system to process immigrants, and used asylum-seekers to justify its plan to build a border wall. “We must treat these vulnerable families and migrants with dignity and respect,” said Castro, who chairs the Congressional Hispanic Caucus. The numbers of arriving migrants “confirm what we said all along — it is even more than an emergency, it is a total system failure, and the only people that can fix it are Congress, working with the president,” Cornyn said. WHY A SURGE OF MIGRANT FAMILIES? Randy Capps, director of research for U.S. programs at the Migration Policy Institute, said the driving forces behind the problems in El Paso are many and complex.